NOT UP FOR A MARATHON? 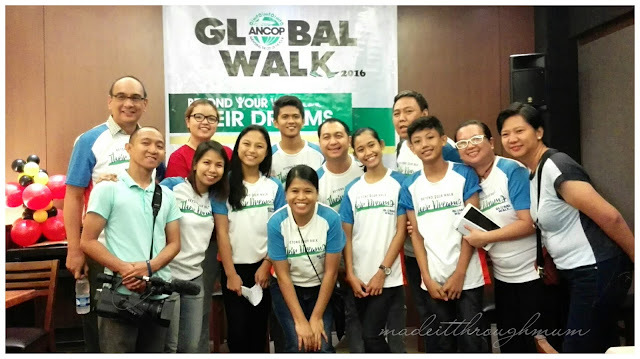 Lace up your shoes for the ANCOP GLOBAL WALK. I love to see students succeed and use education as a way of achieving their dreams. But really disheartens me hearing stories about children who wanted to go to school and eager to learn but poverty hampers them. Happy to know that there's a group who helps these children. Im priviledged to attend Couple's for Christ initiative for ANCOP (Answering the cry of the poor) conference themed Global Walk 2016 : Beyond your Walk, Their dreams. We are used to see and hear about Fun Runs for fitness or to achieve a personal goal. Others do so in order to push their advocacies, like taking care of the environment, or the restoration of a cultural or historical heritage, or sending children to school. But not everybody can run a race to help promote advocacy, like me because of my condition. Consequently, the birth of the ANCOP Walk. Twelve years ago, ANCOP Canada thought of organizing an event where people of all ages and from all walks of life can participate in raising funds for education and likewise create an awareness about ANCOP. ANCOP is Couple's for Christ's work with the poor initiative. And so, on August 21, 2011, the ANCOP GLOBAL WALK was born, with the tag line "I will walk for a scholar. Walk with me!" This initial effort, which happened on the death anniversary of the late Benigno Aquino Jr., paved the way for a new way of heroism -- that of taking a step to change the future of the ANCOP scholars. For Metro Manila alone, an estimated 35,000 walkers trooped to the SM MAll of Asia grounds at dawn for that historic walk. 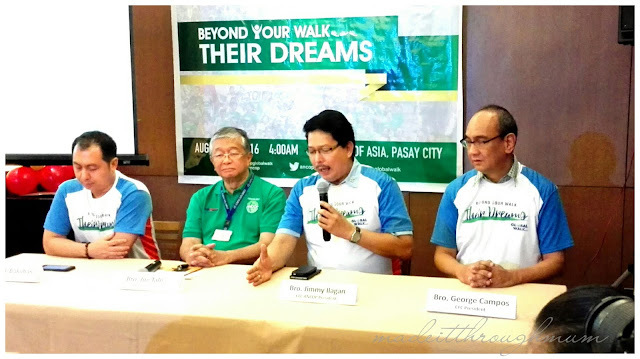 On August 14, 2016 the ANCOP Global Walk returns to the SM MOA, hoping to triple that initial number by targeting 100,000 walkers who will send 2,000 scholars to school. Men, women and children of all shapes and sizes can join the ANCOP Global Walk. And like in the past AGWs, pet dogs have a regular fare as well. Believe it or not, their humans register their family pets too! 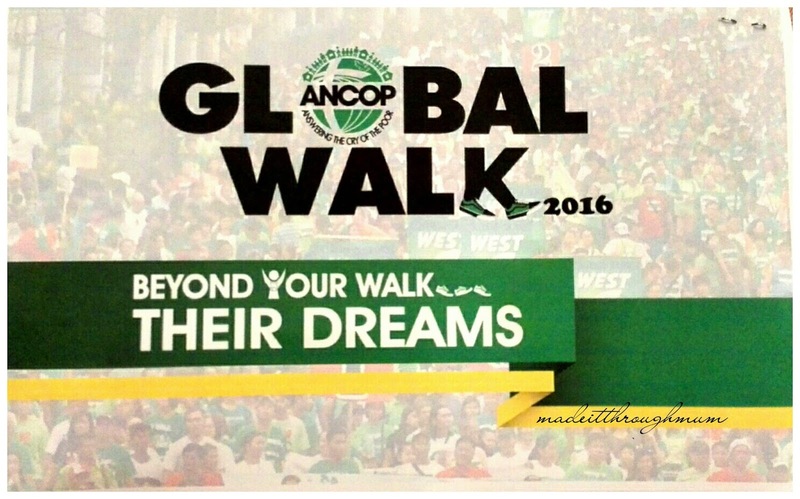 The ANCOP Global Walk will be held in Metro Manila at 4am of August 14, 2016 at the SM Mall of Asia grounds, Pasay City. Registration fee is P300. Simultaneous walks in major cities in the Philippines, the USA, Canada, and Australia, among others, will also happen on August 14. So, if you are looking for an event to join (that isn't a marathon) and help a cause at the same time, why not try the ANCOP GLOBAL WALK? Visit ANswering the Cry Of the Poor (ANCOP) website www.cfcancop.org to know more about ANCOP and its programs. CFC ANCOP is a non-profit organization which was founded by Couples for Christ, a faith-based international organization of Catholic faith recognized by the Vatican.